Flight Delays: Worse than Reported? Even the airline industry is warning that this summer will be the busiest on record and asks passengers to prepare for flight delays. 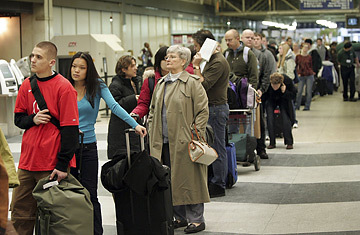 But are there more delays than airlines and federal agencies are officially disclosing? Incidents like JetBlue's meltdown last February may be more common than previously thought. On Feb. 14, 10 JetBlue airplanes sat on the tarmac at New York's JFK Airport for more than nine hours. That incident came less than two months after over a hundred American Airlines and American Eagle planes sat on tarmacs throughout the South for up to 10 hours. Uproar by angry passengers ensued and lawmakers threatened legislation to prevent further "tarmac strandings." In its defense, the airline industry pointed to the official data on tarmac delays as recorded by the Bureau of Transportation Statistics (BTS), the federal agency responsible for tracking delays on behalf of the Department of Transportation. According to that data, 36 planes sat on the tarmac for more than five hours in 2006. "We have 7.2 million flights in the United States each year. This kind of a thing happens a fraction of a fraction of the time," David Castelveter, a spokesman for the Air Transport Association (ATA), which represents 90% of consumer carriers in the U.S, said in May. But it turns out that the BTS data on tarmac delays is inaccurate. Currently, the BTS does not record the total time a plane spends on the tarmac if the plane returns to the gate and then later takes off. It also does not include the tarmac delay times if the plane had been diverted from another airport or if the flight is ultimately cancelled, says David Smallen, a BTS spokesman. Those flights are just recorded as "diverted" or "cancelled," regardless if passengers have sat on the planes for hours, according to Smallen. One such incident involved American Airlines flight 1348, which was supposed to fly from San Francisco to Dallas on Dec. 29. The flight was among the 69 that American diverted that day because of storms in Texas. Passengers aboard flight 1348 ended up landing in Austin and sitting on a tarmac there for almost nine hours before they were allowed to deplane because no gate was ready. But according to the BTS records, flight 1348 was simply "diverted." "It's like our flight didn't even exist," says Kate Hanni, a passenger onboard flight 1348, which she says had overflowing toilets and little food or water. She went on to found the Coalition for an Airline Passenger's Bill of Rights, a grassroots organization that is lobbying Congress to federally mandate that all tarmac delays be capped at four hours. When Mark Mogel, a member of Hanni's coalition, logged onto the BTS website to find data on Hanni's flight delay, he turned up empty-handed. Mogel wasn't the only person to discover delay discrepancies. Rep. Jean Schmidt, a Republican from Ohio, did some digging of her own after being delayed on an airport tarmac for two hours in January. Schmidt, who sits on the House Infrastructure and Transportation Committee, was also shocked to find the loophole. In June, she introduced a bill that would require the BTS to record tarmac delays of all flights, regardless of returns to the gate, diversions or cancellations. "I think we need to know what the true picture is of these delays, because it could be underreported by as much as 50%," says Schmidt, who adds that she can only guess at the actual number of delays. The BTS is hoping to make Schmidt's legislation unnecessary, however. In June, the Bureau launched its own review of data collection methods regarding tarmac delays. According to Smallen, BTS didn't realize its data was inaccurate until after it "was brought to our attention following JetBlue," he says, referring to the JetBlue tarmac delays at JFK in February. After the BTS completes the review, it may change how the data of tarmac delays is recorded. In a curious turn, the Air Transport Association  which originally used the BTS data to defend the airline industry's handling of tarmac delays  now supports the Bureau's improvement of its data collection and even issued a press release the day before the BTS began its review. "When it gets out that the airlines knew the flight data was inaccurate, there's going to be a backlash against them," Mogel says of the ATA. "Obviously they've been strategizing about how to handle this so that they're on the right side." For now, it's almost impossible to determine how many flights are getting delayed on the tarmac. Smallen acknowledges that the available BTS data cannot accurately answer that question. To find data on Hanni's flight, Mogel  who runs a business developing software products  had to sift through FAA records to see when and where her flight actually landed. "That process of brute force takes about 30 minutes per flight," he says. "In 2006, there were 120,000 cancelled flights and 16,000 diverted flights. We're talking 136,000 flights to look at." Castelveter admitted that with new reporting procedures, the BTS data on flight delays would increase. But he stressed the importance of keeping it all in perspective. "Even if the numbers [of reported delays] double, quadruple or increase tenfold, relative to the 7.2 million departures each year in the United States, the numbers would still be a decimal," he says. But that decimal represents a lot of unhappy airline travelers.